A dear friends Aunty who I lived with for six months in Brighton, the UK, (20 odd years ago now), would steam her brussels for hours on end. On a Sunday morning (it was always a Sunday) she would begin the day by steaming the vegetables for the evening meal (gulp). The poor overcooked brussel sprouts would then sit all day on the stove top sweating in their pot till we all came home from the pub and she’d proceeded to heat them again before serving our Sunday roast with something I can only refer to as muck. It was a crime against the vegetables and one that brussel sprouts never made a recovery from. That is till this year, when I pushed aside those horrid memories and took to roasting them. Suddenly there was reason to love this misrepresented vegetable. To write a recipe for it. To post it here on this food blog. I urge anyone who has a brussel sprout phobia to fight back. 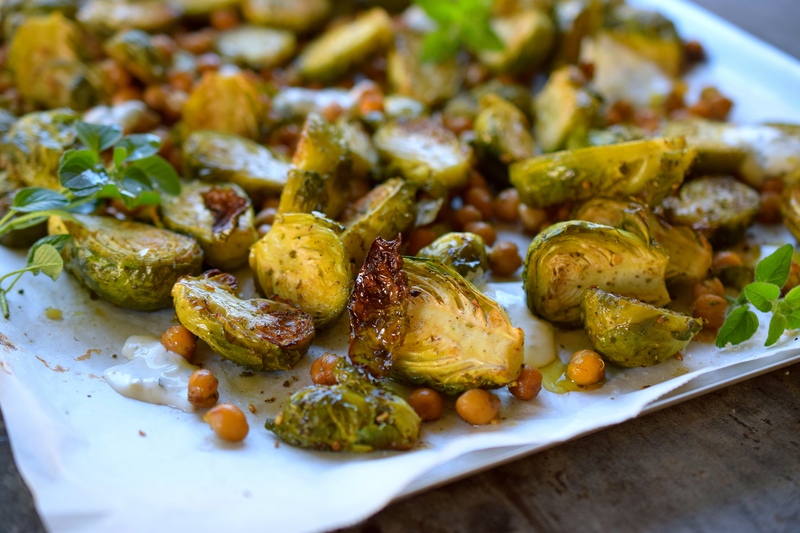 To say ‘No’ to hating brussel sprouts, and ‘Yes’ to roasting them. This quick and easy way of preparing them with za’atar, garlic, chickpeas and extra virgin olive oil is so delicious, and so simple, that it is side dish you will be sure to fall back on time-and-time-again. It’s a side dish to serve with a roast, or a good steak, or any number of other vegetable dishes like creamy potatoes and baked pumpkin. And what I really love about this dish is the whole cloves of garlic, roasted with the sprouts then skinned and chopped and folded through Greek yoghurt with mint if you fancy, the taste is strong yet subtle, creamy and rounded. Cut the washed brussel sprouts in half and place in a large bowl. Add the drained chickpeas, za’atar, 2tbsp extra virgin olive oil, garlic, and sea salt and cracked pepper, toss till well coated. Line a large tray with baking paper and spread the brussels over the tray. Roast for 30 minutes, or till roasted and caramalised looking. Half way through cooking sprinkle the sprouts with 1 tbsp water to add moisture during the roasting process. Set the sprouts aside and pick out the garlic, remove the skin and chop it to a fine paste, combine the garlic with the yoghurt, mint, lemon juice, 1 tbsp water, and season with sea salt and pepper. Dollop the garlic yoghurt all over the brussel sprouts and serve warm. You have so many of my favorite things going on in this one dish, it seems like you made it specifically with me in mind! I love za’atar but rarely think to use it. I’ll definitely have to break out the spice jars for this recipe ASAP. Oh yes you must! Za’atar can, and often should, be sprinkled on just about any thing – especially roasted vegetables. This is such gorgeous work. I have no words! Very sweet Anika, thank you. I think you officially sold me on brussel sprouts. Great post! It came out of beautifully. I’ve already committed to attempt this recipe this week. Thanks!